Plenty of stock as you can see from photo! to relieve the short-term symptomatic relief of heartburn. Last up to 12 hours per dose. Hangover prevention guaranteed with Ranitidine. 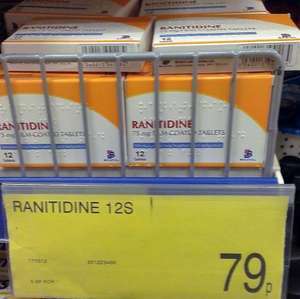 Hangover prevention guaranteed with Ranitidine. Great price. I normally take about 3 maybe 4 of these about an hour or so before too going on the lash. Breaks down all the nastiness in your gut during your session and leaves you feeling 1m% better the next day. I was amazed when someone told me about this stuff and naturally laughed at them until they threw down the gauntlet and I accepted. Needless to say I was smashed beyond belief that night but the next day was bright as a button. This is the generic name for Zantac by the way and make sure they have 75mg Ranitidine otherwise they don't work. ^^ Bad Move. That is bad info. Hangovers are caused mainly by dehydration. One of Ranitidines major side effects, regardless of if you have been drinking alcohol is dehydration. Drink Alcohol whilst taking Ranitidine actually doubles your chance of a serious hangover. Ranitidine is used to treat gastric reflux disease - GERD / Stomach ulcers & Excess Acid etc. As Excess Acid is a major side effect of drinking Beer. Ranitidine will definitely ease the chances of you having an upset stomach, but it will not cure a hangover. Best to take Ranitidine an hour before bed when you've had a few beers and finish the night off with 2 or 3 pints of water. It's actually the water that is curing your hangover. Yep. Totally forgot the water bit. Rehydration is paramount - that's why your brain hurts in the morning guys. This stuff does work though. Bit always read the label folks. Very interesting, didn't know any of this about it. My son's prescribed it when he's on steroids as part of his chemo. Yep. Totally forgot the water bit. Rehydration is paramount - that's why … Yep. Totally forgot the water bit. Rehydration is paramount - that's why your brain hurts in the morning guys. This stuff does work though. Bit always read the label folks. To be fair there is an urban legend that when first invented Zantac was originally touted as a cure for Hangovers - and again to be fair if it wasn't for the damn dehydration it would be perfect. The story has it that the inventor had to change it's status to a cure for reflux etc so as to get it over the counter and not prescription only.? (I doubt that is true - maybe made up by a drunk person - lol) - But there is no denying that it definitely helps with alcohol induced sickness. To be fair there is an urban legend that when first invented Zantac was … To be fair there is an urban legend that when first invented Zantac was originally touted as a cure for Hangovers - and again to be fair if it wasn't for the damn dehydration it would be perfect. The story has it that the inventor had to change it's status to a cure for reflux etc so as to get it over the counter and not prescription only.? (I doubt that is true - maybe made up by a drunk person - lol) - But there is no denying that it definitely helps with alcohol induced sickness.